The Leaning Tower of Pisa is one of the most recognized monuments in the world. We have all seen the dune sand brown tower with a slight inclination and there's no way one could have missed the umpteen funny pictures of people in calculated poses - pushing the Leaning Tower of Pisa, holding it's tip and the likes! Located on the Piazza dei Miracoli in the quaint city of Pisa, the Leaning Tower of Pisa which is also known as the Torre pendente di Pisa makes for a great day trip destination for all those visiting Rome or Florence. 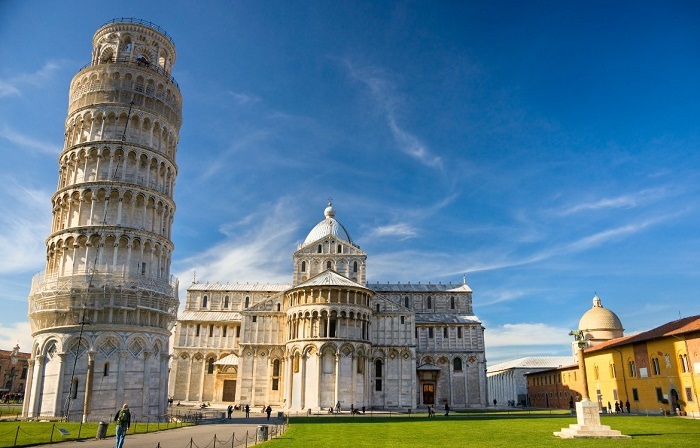 If you're planning a trip to the Leaning Tower of Pisa during your Italy vacation, here's our all inclusive guide that will help you plan the perfect trip. Why / What Caused the Leaning Tower of Pisa to Lean? The City of Pisa had grown from a small seaport town to a regional powerhouse in the 12th century, mostly from to the treasure accumulated from the attack on Palermo and Sicily. To flaunt their prosperity, Pisa began to construct grand buildings and opulent structures - the Field of Miracles.which is known as Piazza dei Miracoli was hence contrived. Around this period, back in August 1173, construction of the Leaning Tower of Pisa began and took 344 years to completion. Since its construction took so long, multiple Italian architects have been involved in its construction - Bonanno Pisano and Gherardo din Gherardo being the famous few. However, the architect who finished the work is Tommaso Pisano hence he is most widely known as the architect. While google will tell you that the Leaning Tower of Pisa is 57 meters tall, it accurately measures 55.9 m at its lowest point and highest point is 58.36 m.
There are 7 bells sit in the bell-chamber at the top of the tower, each one represents a musical note from the major scale. Though you can still see them if you climb to the top of the tower, they haven't been touched since the 20th century because restorers worried that their movements would make the tower lean all the more. While the Germans used the tower as a lookout during World War II, the American troops never bombed the area despite knowing this because they were in complete awe of its beauty. Sweet eh? Benito Mussolini, Italy's 20th-century dictator was actually ashamed of the Leaning Tower of Pisa and considered its faulty construction a matter of national disgrace. He planned on fixing it, but his plan backfired and the tower began to lean more. He decided to drill hundreds of holes in the base of the tower and pump in grout and mortar to essentially ballast the entire structure and set it straight. In reality, this created an even heavier base that made the tower lean even more than it had before. There are 294 steps on the north side of the tower and 296 steps on the south side. Obviously, this is due to the tilt. Barring additional efforts to prevent future leaning, the tower is predicted to remain stable only for the next 200 years. If everything else remains constant, the ground should begin giving way again in the early 23rd century, allowing for the tilt to slowly resume. There are several other towers in Pisa that also lean: the bell tower at the church of St. Michele dei Scalzi, and the bell tower at the church of St. Nicola. As of 2018, the Leaning Tower of Pisa is leaning just a little bit less thanks to years of remedial engineering works and the distinctive tilt has been corrected by four centimetres (1.5 inches) over the last 20 years. If the construction of the tower had not been halted the first time due to World War II, it would have toppled over. The hundred years it had to sit helped to let it settle (compact). Who actually built the Leaning Tower of Pisa is still ambiguous. Experts have tossed around at least three different candidates. Initially, the Leaning Tower of Pisa used to tilt the other way. Overcompensation during the second phase of construction shifted the center of the gravity and the tilt went from northward to southward. The lean was so bad by 1964 that the tilted side was 17 feet off center. The government then put out an open call for suggestions on fixing it. The Leaning Tower of Pisa isn't the world's most tilted tower. The church tower in Suurhusen, Germany has a larger natural lean in the world. Galileo may have used the tower for some of his most important experiments, but the story of him having dropped cannonballs and feathers from the tower to show that objects of different weights fall equally quickly is said to be a hoax. While most people think that the Leaning Tower of Pisa was designed to "lean"�, the tilt is actually an architectural folly. By the time the third story was constructed, the soft ground on which it was built resulted in a soil shift and subsequent destabilization of the tower's foundations. This was not planned for and neither were architects in the age prepared to handle such a scenario. In the next 800 years, architects realised that the Leaning Tower of Pisa was gradually leaning at a rate of one to two millimeters per year. Today, it stands more than five meters off perpendicular and is expected to remain stable only for the next 200 years. By the 23rd century, the ground is calculated to giving away, allowing for the tilt to slowly resume. I must admit the insides of Leaning Tower of Pisa are quite unimpressive in contrast to its sculpted marble exteriors. It is mostly hollow with plain marble walls and a narrow flight of stairs. However, going inside the Leaning Tower of Pisa is the only way reach the top, hence I'd urge you all to buy a ticket and step inside this monumental structure. Once you step inside the Tower of Pisa, the candid exterior appearance of the Tower seems a distant memory, with the inside looking altogether different. With no artificial light inside, your eyes take a quick few seconds to adjust to the darkness in broad daylight. Cool air envelops you, no matter how hot it is outside thanks to the plain flat marble walls it is chilly inside. Once inside, you start making your way up 7 towers via 294 slightly slanting stairs. You can stop at each tower and consume terrific views, but the top most landing is undoubtedly the best. After witnessing terrific views of Florence city, make your way down carefully (the stairs are slippery!) and spend the rest of your day exploring the other attractions on Piazza Dei Miracoli. The Leaning Tower of Pisa measures 55.9 m at its lowest point and highest point is 58.36 m. However, most people round it up to a 56m for ease of remembrance. If you've been around the world and want to gauge the height in comparison to other towering monuments around the world, see below image. For context, the Eiffel Tower stands at 324m, Burj khalifa ta 828m and the Statue of Liberty at 93m. Entry slots are every 15 minutes and the last entrance is 30 minutes prior to closing time. The best time for visiting the Leaning Tower of Pisa is before 11:00 AM or post 5:00 PM as these hours see thinner crowds than afternoons. The Leaning Tower of Pisa stands stoically on the grassy fields of "Piazza dei Miracoli"� which translates to "Square of Miracles"�. While the main train station in Pisa is "Pisa Centrale"�, the "Pisa San Rossore"� station is actually closer to the Tower of Pisa . It is only 400m (5 minutes walking distance) from the door/entrance along the walls that brings you to Piazza dei Miracoli. If you can get a train to Pisa San Rossore, nothing like it, but since the station is small ; not too many trains stop here. If you're coming from Florence, Rome and other Italian cities, it is likely that you'll reach Pisa Centrale. Follow the directions below on your preferred mode on transport and you'll reach the Leaning Tower of Pisa, hopefully without getting lost! The walk should take you 20 - 30 minutes but is definitely worth the sweat. The best route takes you by Arno River, across Ponte di Mezzo and Piazza dei Cavalieri before arriving at Piazza dei Miracoli. Walking through the quaint alleys of Florence and discovering Pisa on foot is a lot more rewarding than just seeing the monuments in the city. If you're not in the mood to walk, you can take bus numbers 3, 4 or Shuttle Bus A ; all of which will drop you near the Leaning Tower of Pisa. Make sure to buy your bus tickets before getting on the bus, from the automatic machines. Though you can always buy a ticket from the driver but it will cost more and exact change is mandatory. A bus ticket to Pisa will cost you €1.70 and the ticket is valid for 70 minutes from the time you first use it. Just outside Pisa Centrale, you'll find bike rentals for 10€ for all day (or less if you're interested in just a few hours). Grab a bike and cycle your way through Pisa. It's a quick and efficient way to cover maximum grounds at your own pace. Pickpockets and thieves very highly active around the Piazza dei Miracoli, so keep your belongings close and don't fall prey to their five-finger discounts. If you're taking a car to Pisa you can use the Pisa Tower Parking that is reasonably priced (12 Euro for 6 hours) and since most people come via train, finding a park spot isn't too hard. After purchasing the Leaning Tower of Pisa ticket, you're required to deposit your belongings at the free lockers. This is because the Leaning Tower of Pisa is rather lean and there is no space for your bags and belongings. If you're traveling to Pisa on a budget, check out these free things to do in Pisa. While there are umpteens tickets available for visiting the Leaning Tower of Pisa - combo deals, entry only tickets etc, here's our curation of the Top 10 Leaning Tower of Pisa Tours & Tickets. These tickets and tours have been chosen keeping in mind the best price available on the internet, past customer experiences and vendor dependability. Choose your pick and enjoy Pisa with zero hassles. Discover 3 monuments of the Piazza dei Miracoli. Enter the Cathedral and see the Pisa Romanesque architecture. Visit the round-shaped Baptistery surrounded by its suggestive columned arcades and its Camposanto, originally a cemetery, an extraordinary quadrangular cloister. Save time spent waiting in admission lines with a combo ticket to monuments in Pisa's Cathedral Square. Discover all 4 monuments of the Piazza dei Miracoli. Admire the celebrated Leaning Tower, the Baptistery surrounded by its suggestive columned arcades and its Camposanto, originally a cemetery, an extraordinary quadrangular cloister. After your guided tour of the Square, you'll have the opportunity to climb the Leaning Tower. Discover the Miracle Square and old town of Pisa. Visit Dante Square and admire the Sapienza of Pisa, one of the most ancient university in Italy. See Garibaldi Square located near the Lungarni, go through Borgo Stretto, one of the most popular street of the town. Visit the Church of San Sisto, one of Pisa's oldest churches, and explore the medieval Piazza dei Cavalieri. 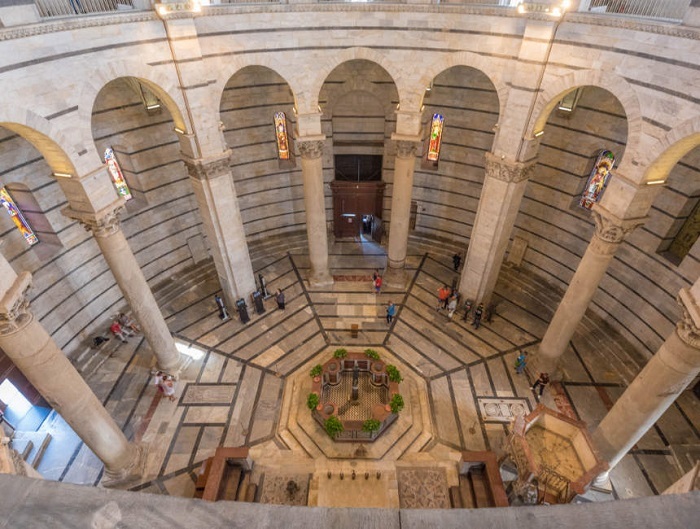 Learn about the Baptistery, the famous Leaning Tower and visit the interior of the Cathedral. Admire the monuments of the legendary Square of Miracles (Piazza dei Miracoli) . Enjoy a scenic drive from Florence to Pisa through vineyards and olive groves . Be enthralled by the history and the leaning structure of the Tower. Like I mentioned before, the Leaning Tower of Pisa stands on Piazza dei Miracoli, the Square of Miracles which indeed stands by its name and houses other miracles apart from the Tower of Pisa. Hence, it is quite convenient for travelers to explore quite a chunk of Pisa within this square's perimeter. Piazza dei Miracoli is also considered to be one of the most beautiful urban spaces in the world and because of the number of historical monuments it holds, it was declared a World Heritage Site by UNESCO in 1987. Here's all that you can witness at the Square apart from the Leaning Tower of Pisa. Also known as the Pisa Cathedral,this medieval Roman Catholic Cathedral was constructed in the Pisan Romanesque architectural style, a lesser known and seen style of architecture. It is dedicated to the Assumption of the Virgin Mary and is the current seat of the Archbishop of Pisa. The fine pastel marble facades with tall blind arcades and three portals with bronze doors are a treat for the eyes and will definitely compel you to enter the cathedral and witness its inner beauty. Don't worry, you won't be disappointed as the interiors are equally, if not more beautiful! The Pisa Baptistery of St. John is the biggest Baptistery in Italy. This Roman Catholic building stands to the west of the Leaning Tower of Pisa. It was the second building to have been erected in Piazza dei Miracoli, after Duomo di Pisa. This baptistery was designed by Diotisalvi and flaunts Romanesque and Gothic architecture with whiffs of Byzantine and Islamic influences. 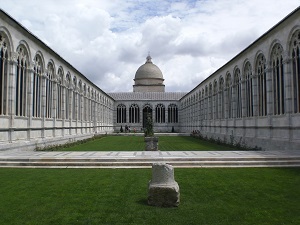 The Monumental Cemetery is a walled cemetery located at the northern end of Piazza dei Miracoli. It is said to have been built around sacred soil from Calvary, brought back by Ubaldo de' Lanfranchi, then archbishop of Pisa. Back in the day, this cemetery contained a large collection of Roman sculptures and sarcophagi, however only 84 of these are on display today. From the above 3 attractions, you will need an entry ticket to enter the Duomo and Camposanto. However, there is a great combo deal that gives you access to all 4 attractions on the Piazza Dei Miracoli which works out cheaper than buying individual tickets. 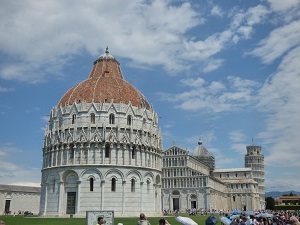 If you're interested in discovering them all, this Pisa combo ticket is highly recommended. Check out the Pisa Tourist Map to see all that there is to do in Pisa. Trains run from the Santa Maria Novella Train Station in Florence to Pisa Centrale in Pisa 3 to 4 times an hour during the weekdays and hourly during the weekend. Know that there are two types of trains that run the route, the faster trains take an hour or slightly less and the slower trains take 10-15 minutes longer. However, the fare for both the trains are same though the fast train tends to be more crowded. From Pisa Centrale, the Leaning Tower of Pisa is a 20 minute scenic walk away. You can also avail a bus or hail a cab to cover this distance, both of which are easily available outside the station. Here are the best tours that take care of your journey from Florence to Pisa and back. By train, the journey takes about 2 hours 47 minutes. You can catch a train from Roma Ostiense or Roma termini to Pisa Centrale , with the first train runnin at 6:57 AM and the last one from Rome at 7:41 PM. There are about 9 trains a day between Rome and Pisa, leaving approximately every 2h24 minutes. 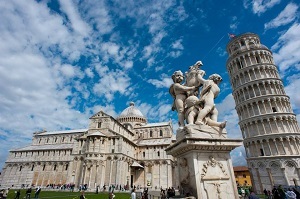 Check out these guided tours that take care of your journey from Rome to Pisa in the company of an expert guide. High-speed trains connect Venice with Florence, and from there you need to change to a slower train for the trip to Pisa. The journey from Venice to Pisa takes around 3.5 hours one-way. On the high-speed trains from Venice to Florence you need reservations as well as tickets, but on the train from Florence to Pisa, you won't need a reservation. Trains from Venice to Florence leave about once every hour.